The Grohe Red is like a fine wine, in that it just keeps getting better with age. This meticulously engineered, Teutonic, instant boiling water tap has been around for a while now, but Grohe has been tweaking and fine-tuning the design. The latest model actually comes in two dazzling incarnations. First up is the duo edition that delivers steaming kettle hot water and a standard hot and cold mixer. On one tap. Meanwhile, the mono edition of the Grohe Red provides you with unlimited kettle hot water, but it has been designed to sit alongside the standard hot and cold taps in your kitchen. Think of it as a ‘lite’ version of the mega duo model if you like. Either way, the kettle hot tap is invaluable if you frequently need hot water up to 99°C for tea, coffee or for carrying out speedy cooking manoeuvres. As you’d expect from anything bearing the Grohe brand name, the design and engineering is excellent. However, never one to sit on its laurels, Grohe has refined the design still further and the Red now features added extras. The most notable of these is the Child Lock, which is just that. It’ll keep your curious offspring safe. If you’ve got small children, or even unruly older family members, this is a real boon as it ensures that nobody can inadvertently douse himself or herself in boiling water. Grohe explains that the kettle hot tap has acquired safety certification from TÜV, which is a well-respected German safety testing body. The two-touch activation system means that hot water won’t start coming through the spout until you’ve pressed the button icons in sequence. Even if you’re a careless adult the Grohe CoolTouch technology means the spout can be safely touched. 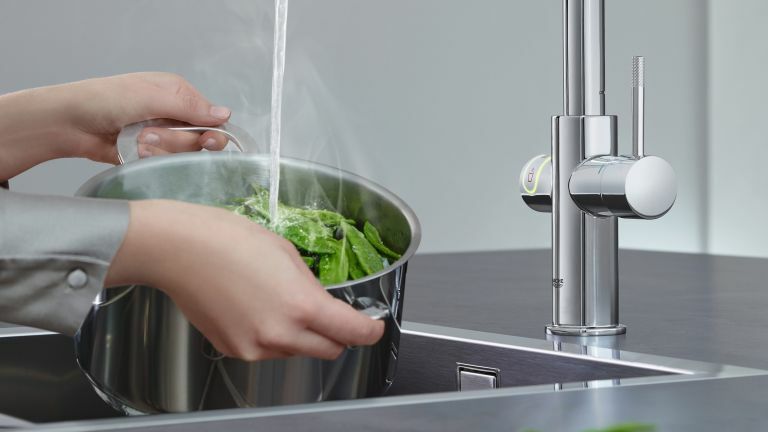 The Grohe Red also adds in a couple of other highlights, with the pot filler function proving handy for anyone needing more than just a cupful. Pot of tea fiends, for example, will find it hard to resist. Grohe has also incorporated a holiday mode feature too, which doesn’t allow you to take your tap on a weekend break, but does mean you can set its boiler to top out at an energy saving 60°C in your absence. Luckily, and indeed rather conveniently, you won’t have to rip out your existing kitchen to enjoy the benefits of the Grohe Red either. The kettle hot water tap can be installed into an existing layout, although you’ll need to check that you have enough clearance underneath your sink. This is because the package includes the aforementioned long life titanium boiler. Depending on your requirements there are 3 or 5.5 litre options to choose from. These also need to have the filter replenished from time to time, which is an additional cost to factor it. As for its green credentials the Grohe Red boasts a class A energy rating too. Needless to say, the tap will require power and, obviously, a water supply close at hand. At the other end of the kettle hot tap concept, the German manufacturer also has its Grohe Blue Home model, which lets you enjoy chilled and filtered drinking water. Said aqua can be served sparkling, medium sparkling or just plain old still. Cool. Actually, very cool.